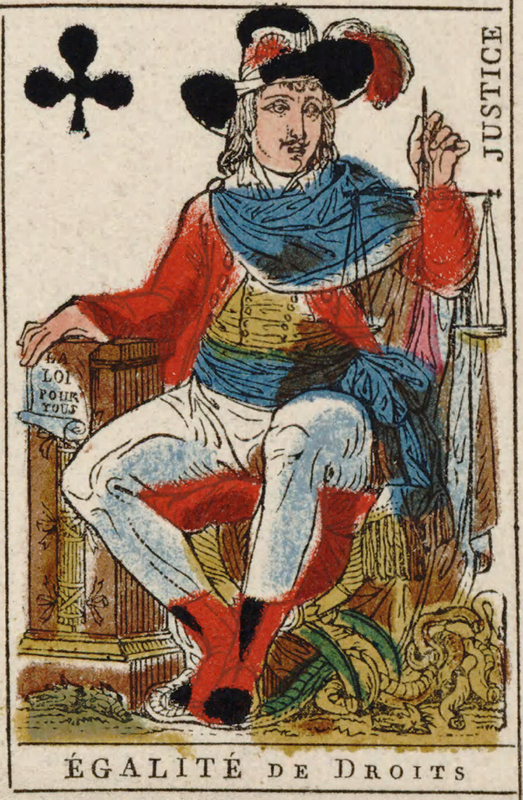 Following the French Revolution and its toppling of the French monarchy, Urbain Jaume and Jean-Démosthène Dugourc conceived the idea of a new deck of playing cards that, like the revolutionaries, would toss out its “aristocracy” of Aces, Kings, Queens, and Jacks—and replace them with emblems of the new society. 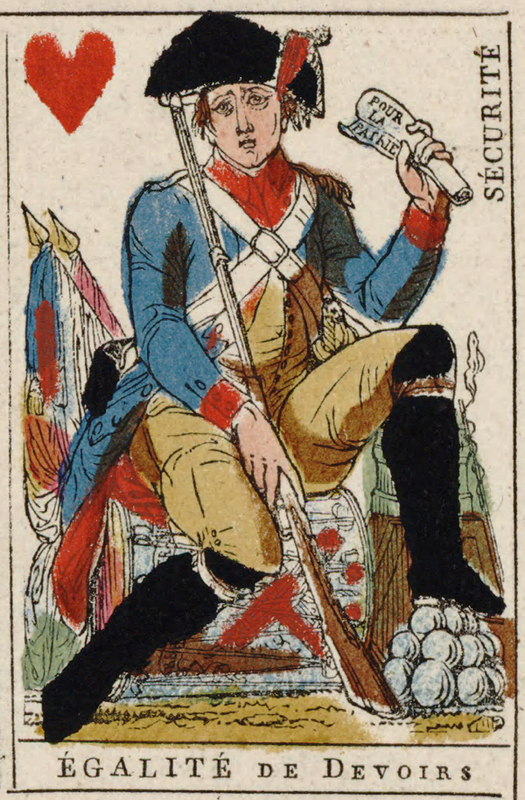 Citizens of the new France did not need reminders of “despotism and inequality” when playing a game of cards. Jack of Hearts: The Equality of Hearts—or Equality of Duties—is a National Guardsman whose devotion to the Country results in pubic security. This word is written near him. 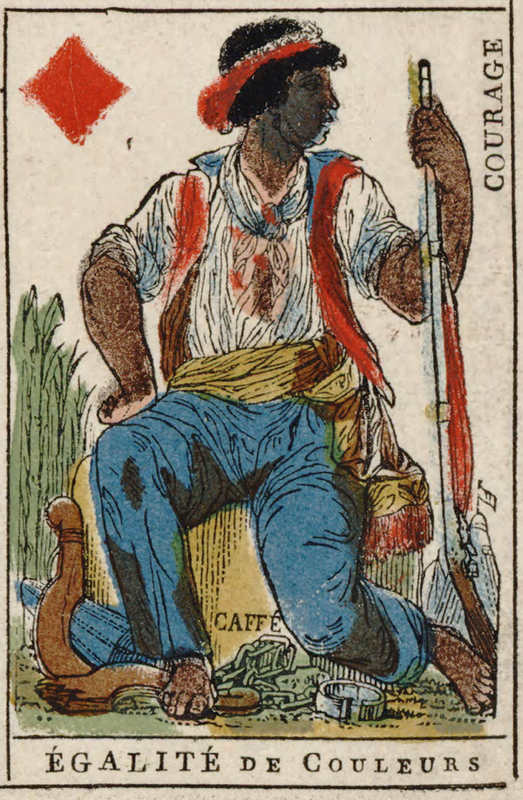 Jack of Diamonds: The Equality of Diamonds—or Equality of Colors: The black man, rid of his shackles, treads underfoot a broken yoke. Seated on a bale of coffee, he seems to enjoy the new pleasure of liberty and of being armed. On one side one sees a camp and on the other some sugar cane; and in the word “Courage” one sees that the Man of Color has at long last avenged himself for the scornful injustices of his oppressors. 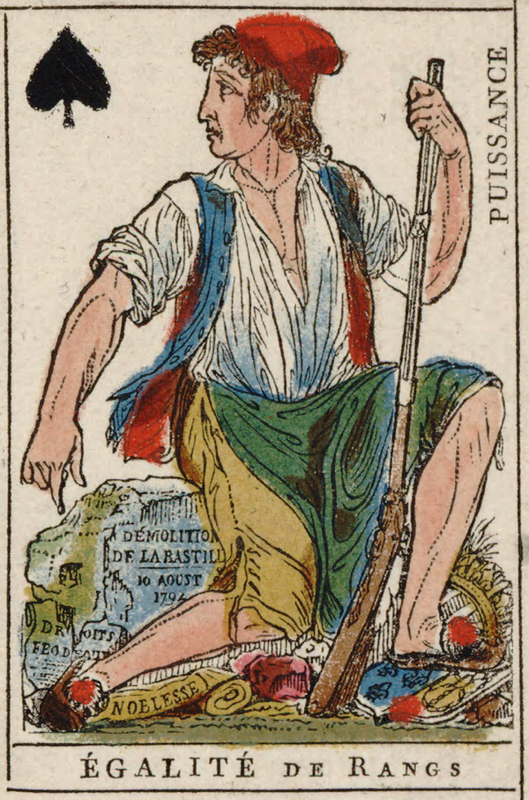 This entry was posted in Uncategorized and tagged 18th Century, Civil Rights, France, French Revolution, Games, Jean-Démosthène Dugourc, Playing Cards, Revolution, Urbain Jaume. Bookmark the permalink.